Then President-elect Donald Trump with former New York City Mayor Rudy Giuliani at Trump National Golf Club on 20 November 2016 in Bedminster, New Jersey. 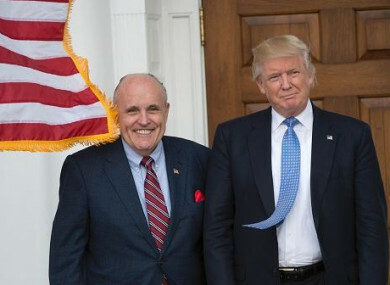 FORMER NEW YORK mayor Rudy Giuliani is joining US President Donald Trump’s personal legal team, it has been announced. “The president said, ‘Rudy is great. He has been my friend for a long time and wants to get this matter quickly resolved for the good of the country’,” Trump lawyer Jay Sekulow said in a statement. Sekulow said Giuliani, who presided over New York City from 1994 to 2001, “expressed his deep appreciation to the president for allowing him to assist in this important matter”. Sekulow also named two other lawyers to the White House team, Jane Serene Raskin and Marty Raskin, specialists in white-collar criminal defense. On 22 March the lead attorney on Trump’s legal team, John Dowd, resigned amid reported differences over how much Trump should cooperate with Mueller. “I’m doing it because I hope we can negotiate an end to this for the good of the country and because I have high regard for the president and for Bob Mueller,” Giuliani told the Washington Post in an interview yesterday. Meanwhile, leaked memorandums show that Trump repeatedly complained to FBI director James Comey in early 2017 that the Russia meddling investigation was a cloud over his young administration, weeks before firing him. Trump “said he was trying to run the country and the cloud of this Russia business was making that difficult”, Comey wrote in a memo on a conversation they had on 30 March 2017. Eleven days later, Trump again pressed Comey about the issue. The president told Comey that “he is trying to do work for the country, visit with foreign leaders, and any cloud, even a little cloud, gets in the way of that”, Comey wrote, referring to “the Russia thing”. The memos, which Comey wrote immediately after several meetings with Trump in the weeks after his inauguration on 20 January 2017, depict a president deeply worried about the impact of the probe into Russian meddling in the election the previous year. Obtained by AFP yesterday after the Justice Department released them to Congress, the memos could become evidence in a criminal investigation into whether Trump consciously tried to obstruct the probe. Comey makes clear in his memos that he was uncomfortable with the pressure and that it was not completely proper, though at the time he did not allege the president had broken any laws. But Comey never committed to easing off the investigation, which continues to examine a number of suspicious contacts between the Trump campaign and Russia. Weeks after their last conversation, on 9 May, Trump fired Comey, saying in an interview two days later that he decided to dismiss the FBI chief in part out of unhappiness over the Russia probe. In my opinion, it should’ve been over with a long time ago. Much of what is in the memos, most notably Trump’s demand that Comey pledge his loyalty, has been known for nearly a year. Comey wrote that the president repeatedly raised the still-unconfirmed story that Russians have a video of him with prostitutes in a Moscow hotel. “The president said ‘this hookers thing’ is nonsense,” Comey wrote. However, Trump also said “that Putin had told him, ‘We have some of the most beautiful hookers in the world’”, Comey noted. Email “Former New York mayor joins Trump's legal team”. Feedback on “Former New York mayor joins Trump's legal team”.